Glymur from near the top of the trail. After talking about visiting Iceland for at least a year, my partner in crime and I finally made it there this fall. 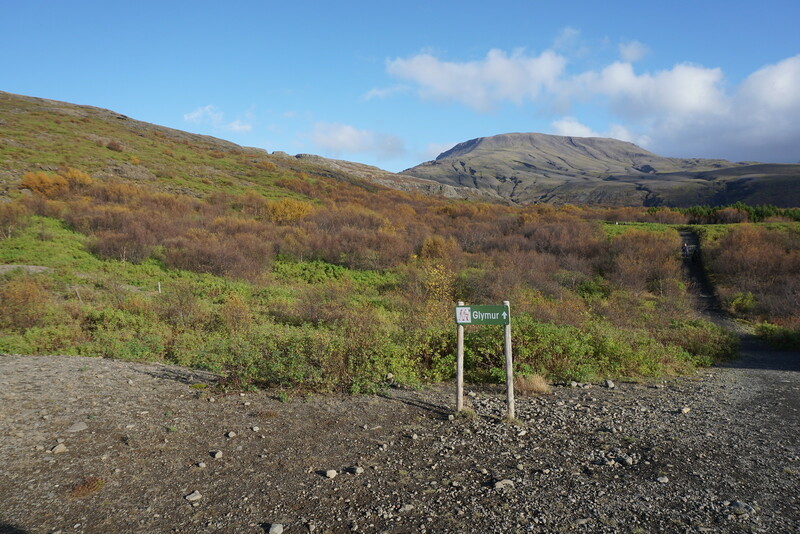 One of the things I was surprised to find was a general lack of pre-trip hiking planning resources, save a handful of super popular trails like Laugavegur. Thank goodness for friends who've been there recently like Heidi, Paulina of Little Grunts, Alicia of Trailspace.com, and many more, along with The Outbound! Though so many of Iceland's incredible sights are right off the road, many of them aren't. 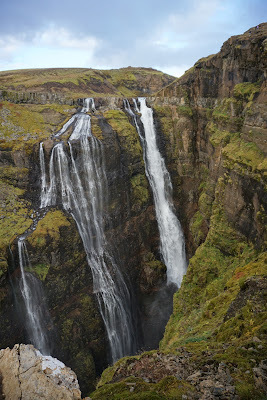 And one of them happens to be what used to be considered Iceland's tallest waterfall - Glymur. It was the tallest until one that's likely taller was discovered one near the Vatnajökull glacier. On the second day of our week-long trip to Iceland, we made the trek to Glymur, went a bit beyond, and it turned out to be one of the highlights of the trip for me. Glymur is popular because it's beautiful, but also because it's only an hour from Reykjavik, Iceland's capital city. The trail starts from a parking lot here, and if it's one of your first days in Iceland like it was for us, you'll find the drive itself absolutely spectacular. Most of it is on paved roads, but the last stretch to the parking lot is on a bumpy gravel road. You don't need a high clearance vehicle, but it certainly won't hurt. 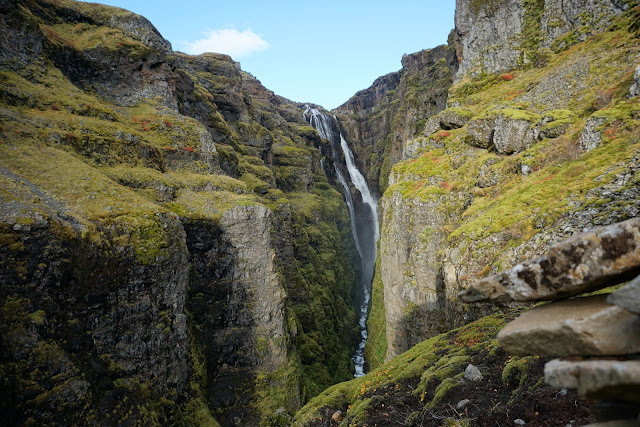 The hike to Glymur is 7.1-7.5 km (4.3-4.6 miles) round trip, depending on the route you choose. Hikers can either make a loop out of trails up the north and south sides of the canyon, or choose an out-and-back. 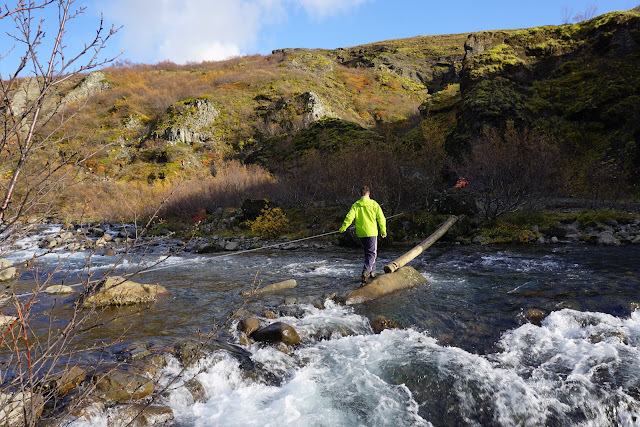 The loop involves fording a river above and beyond the falls, and given the temperatures in Iceland in October, we chose to go up and down the south side. Take a look at an estimate of our route here. Pretty hard to miss some of the trail signs at the beginning! After passing through a gate at the end of the parking lot, hikers can walk side by side at points along an often muddy path. The trail meanders through brush and open spots until, 1.3km in, the real fun starts. Hikers come to þvottahellir, a small cave, and when we walked down into it, it took my eyes a bit to adjust enough to see the path in front of me. After popping out of the other side of the cave, the trail drops down toward the creek, and toward what we affectionately named the Log of Doom. It's a telephone pole-sized tree trunk purposely placed above the rushing water to allow hikers to cross. It's likely going to be wet and slippery, but there's a steel cable to help you balance. I stared straight at the log, gingerly placing one foot in front of the other, and made it across without incident. My partner in crime crossing the log, it would've been quite a river crossing if it wasn't there! The real climbing begins post-Log of Doom; it's straight up the side of the canyon from there. The climb is rocky, steep, wet, and slippery at points. I was grateful for my trusty pair of Scarpa boots, and for the strategically placed ropes up some of the steepest sections. The trail is a leg burner without a doubt, but glimpses of Glymur and the general incredible beauty of Iceland were plenty enough to distract me. There are plenty of places to stop and look around, including a few exposed mounds of rock where a fall would send you straight down into the bottom of the canyon. We did our best to stay on the trail; it's clear the area sees a good amount of foot traffic, and the last thing any of the fragile flora around there needed was two more people stomping on them. Our objective for the day. Something, isn't it? One of the best things about hiking in a place with so few trees is on a clear day, even on a cloudy day, it's easy to see where you're going and how far you have left to climb on a hike like this. We could see Glymur most of the way up, and when we got to the top of the falls, we kept going, just to see what else we could find. I'd read it was possible to ford the river and hike down the north side, but taking my boots off and wading into freezing water when it was just over 40ºF outside wasn't appealing. We tried to find a suitable place to cross without taking our shoes off, and eventually gave up. Regardless, we left the crowds behind when we walked beyond the falls, and it doesn't take much to make it feel as though you're all alone in the world in Iceland! Beyond Glymur, watching two people ford the river. 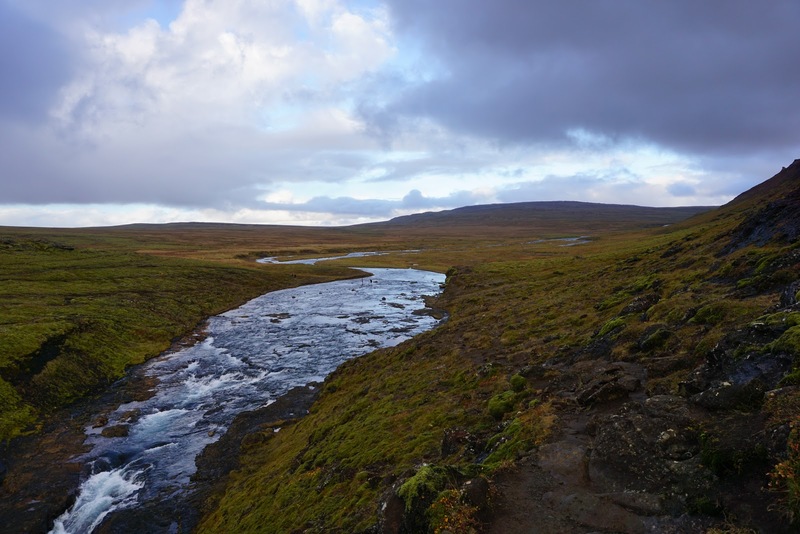 See if you can spot them, it'll give you an idea of how vast the landscapes in Iceland are! We retraced our steps back down the south side of the canyon, crossed The Log of Doom, and made it back to the car in about three hours. 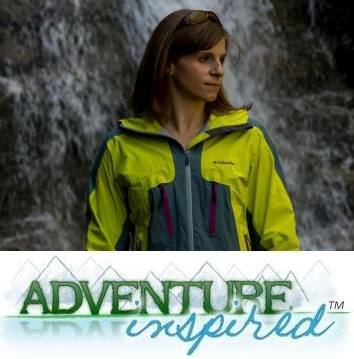 Wear sturdy, waterproof hiking shoes or boots. This basically applies to all of Iceland, whether you're hiking or not. You'll inevitably step in a puddle at some point, or it'll rain, or both, and a good pair of boots is absolutely essential for a walk up to Glymur. The trail is easy to follow, and yellow blazes painted on the rocks will help you stay on the trail when it's not as obvious on the rockier section. Stay on the trail. Around Glymur and all over Iceland, we saw evidence of human foot traffic causing irreparable damage to the landscape. There are no facilities at the parking lot; plan accordingly. I carried Sh!t Kits on all of our hikes in Iceland, and found them beyond helpful to have with me. As is the case with the rest of Iceland, weather can change in an instant. Keep your eyes on the clouds, and if it looks like bad weather, consider changing your plans. Much of this trail skirts a deep canyon, and one wrong step could be really, really bad. Who's done this hike, or other hikes in Iceland? I'd love to hear from you, and learn about what trip planning resources you used!